Showcases are a great way to show your visitors your latest addition to your portfolio or to present the latest product or article. Many sites use this technique to cram information into an area so that your visitors do not miss your message. 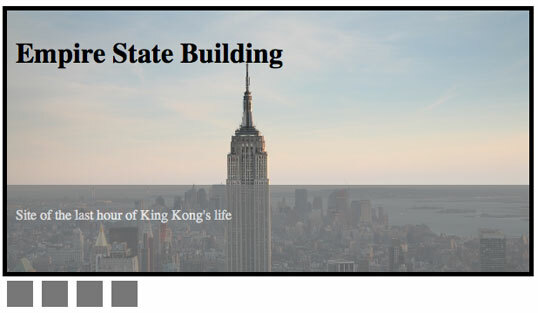 This tutorial will show you how to create such a showcase by utilising jQuery. jQuery makes animation easy. This tutorial will guide you through the setting up of your HTML, CSS and the associated jQuery code to create the showcase. The viewport div is our window to the content that you wish to display to the user. We’ll use CSS later to ensure the viewport only displays the content you want. Inside the div, we will be enclosing two further divs; one for the sections and another for the labels which will pop up when the viewport scrolls into view. Both of these will be inside another div: scrollable which will be the element we use to scroll all the content within it into view. The sections div will contain four further divs which will represent our sections and the labels div will contain another four divs to represent our labels. Lastly, we’ll create a row of simple buttons so we can elect to scroll a certain section into view. We’ll start with the viewport itself. We want to set the dimensions of the viewport, ensure that any content within it does not flow out and we’ll add a thick 5px solid border. The sections and labels divs are very similar. The width will be determined by the number of sections you want to have multiplied by the width of each section. In this example, our sections are 600px wide and we will be using four of them so the width of the #content and #label divs will be 2400px (4 x 600px). The width and height are all we need to style the sections div. The label div is slightly different since we require it to slide out of view when we click on a button and it does not need to be 300px as this would obscure the entire viewport when it came into view. We’ll set this to 100px high. We also need to ensure that the label appears when the page is first loaded, so we set the bottom property to 100px so that it appears 100px above the bottom of the div in which it resides. We also require setting the position to relative so we can use the bottom property. Both contents and labels are wrapped in another div identified as scrollable which will be the element we use to move all the content within it. This needs to be set to the dimensions of the content div as this contains all that will be viewable in the viewport. We need to set the position relative since we will be taking advantage of the left property via jQuery to scroll the content into view. We’ll look at the individual section divs now to style them for our purposes. Each div classed as section needs to float left of each other otherwise the content will flow out of the containing div and onto the next row. We need these to be next to each other so that when we alter the left position of the #scrollable, the relevant section will come into view. Our sections will be 600px wide by 300px hight wide but we’ll add some padding of 10px so everything isn’t flush to the sides of the viewport. Our height and width will need to be reduced by 20px to cater for this. The individual label divs will be 600px wide and 100px high with a 10px padding. We also need to float these left so that they appear next to each other and don’t stack on top of each other. We’ll also set the background colour of the label to grey and the colour of the text to white. We’ll add some images to the background. I used some images from wikimedia commons, scaled them down to 600px by 300px and set them as background images. The last bit of styling we need to do is the menu section which will allow us to scroll through to the various sections. You can do this in any manner you want but for this example, we’ll just use some simple divs wich will be 30px by 30px, have a background colour of grey and be spaced 5px from each other by setting a margin of 5px. These buttons will all be wrapped in another div which we don’t need to style but contains all of our buttons. So that is all the css done and now we’re ready to get our hands dirty with jQuery. We’ll start first by examining what it is our showcase “widget” will do. When we click on one of our buttons, we want our label to drop down out of view, the new section to come into view and then the label to pop back up again. We’ll be scrolling the scrollable div so we only need to be concerned with scrolling that – everything within it will be dragged along. There are a number of ways to implement this but we’ll cover the queue function that jQuery supplies. Queuing is the principle of adding events to an object and then dequeuing them or executing them. We’ll create a function which queues three functions to hide the label, scroll the viewport and then show the label. Queuing an event requires attaching the event to an object in the DOM. You can create custom queues or, if not specified, you can use the default queue (called ‘fx’). Once you queue an event in fx, the first function will execute. However, the next function needs to be explicitly called to execute. The main function navigate will set up the queued events. We will also add a function to clear the queue so that events don’t back up which would result in the queue getting larger and taking longer to complete. clearQueue(), if supplied with no arguments, will clear the events on the default fx queue. We’ll define these functions next by using the animate() method and make use of a callback to dequeue the next event. To hide the label, we need to move the bottom position of the label to 0px making it disappear from the viewport and we’ll nominate that this takes a quarter of a second or 250 milliseconds. We also need to ensure that the next event in the queue executes and so we create an inline function dequeueing the next event. The last function needs to show the label again, so we set the bottom css property back to 100px and ensure this takes place over 250 milliseconds. We don’t need to trigger the next event in the queue as this is the last in the sequence. The next thing we need to do is attach the navigate event to relevant elements on the page. In our case this would be the four buttons we defined earlier. The best way to attach these events is to do it through jQuery. The document needs to be fully loaded before we do this so we use the ready() function to wrap the code in. We use jQuery’s click function to instantiate an anonymous function which in turn triggers the navigate function with an appropriate value for position. We’ll also add a piece of code to set the opacity initially to 0.7. This is where jQuery really excels. There are many inconsistencies between browsers with the css opacity property but we don’t have to worry about that. All we need to do is specify the W3C standard opacity property. jQuery does the rest. Again, this can be added to the ready() function. Now that the event is detached, the animation won’t be stopped should our mouse enter the label area. We’ll need to reattach this once all the animation is complete. A sensible place to do this would be to call an anonymous callback function in the showLabel() function since this is the last in the queue and will only execute when this is complete. In this tutorial you learnt how to create a simple showcase widget. You used HTML and CSS to style it and most importantly used the overflow property to limit the view of the viewport. Queuing and dequeuing events with jQuery enables you to execute events asynchronously and binding and unbinding events enables you to exert more control over the UI to prevent unnecessary animation. This example is easily extend to create more sections. You just need to make sure the widths of #content, #scrollable and #label divs are expanded to including the extra sections that you wish (remember – 600px per section) and of course, add an extra section in the #content div and a related label in the #labels div. You can download this tutorial’s source code here.